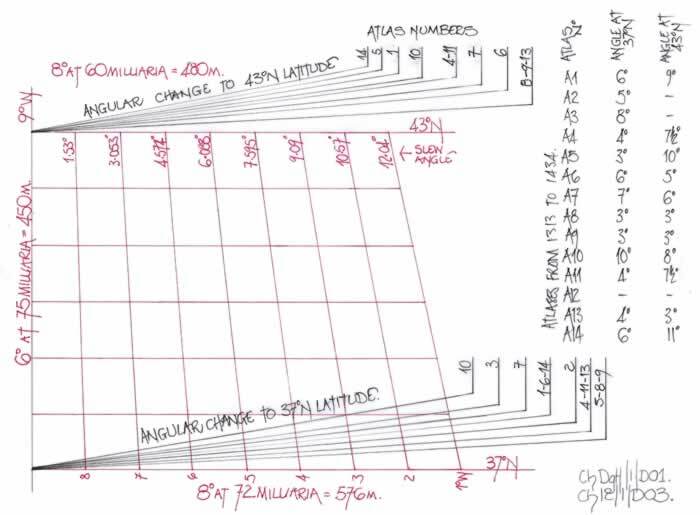 PORTOLAN CHARTS & THEIR STANDARD DISTORTION WHENCE CAME THE PORTOLAN CHART? ROMAN, YES! It is first necessary to refer to my previous texts which should be investigated by researchers who wish to ascertain an in depth understanding of this paper as now I will only simply cross refer and use a single original text, cgPl/2 for the basic forma. cgPl/1; Geographical extracts from and analysis of “The Natural History” by Pliny. cgPl/2; Marcus Vipsanius Agrippa- His map; Gaius Plinius Secundus- His text. 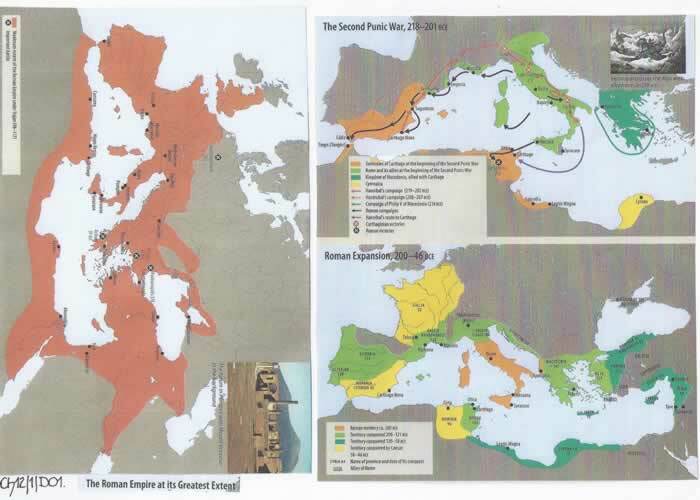 cgFIG; The Roman World Survey + power point- ancient measures. In those preceding texts I stepped forward the timescale of Portolan Charts and Atlases endeavouring to establish when these charts became properly geographical. That actually became less important as the investigation proceeded over many years than to establish why these Portolan Charts were slewed when the wind rose was drawn correctly NSEW. Delving into the extant ancient texts the answer unfolded gradually once it was realised that the ancient view of the Earth was bi-fold; that is, it was understood that there were two Earth views, Geographical and Astrological and either could be used descriptively. Thus it became necessary to investigate both strands (and also the measurement systems) which led to “Climata” and “Parallels” being seen as variable in each strand and measurements being ridiculously used with no apparent basis in fact at all. Thus having started at 1311AD, moved forward to 1435AD and then 1565AD, it seemed opportune to include text from 1665AD and “Joan Blaeu’s Atlas Maior” where he sets down the historical and factual ( for 1665) ideas concerning the Earth and Geography in an introductory letter to his readers. I conclude this text with further Joan Blaeu text notes. Gentle Reader, those who define history as the heart of civic prudence and geography as the heart of illumination of history seem to state things aright. For no exploit great or small is performed without location, nor can any place on earth be accurately defined without Geography. In history knowledge of persons is important but knowledge of period and place no less so. Ignorant of Thermopylae, you cannot comprehend the Spartans’ battle against Mardronius; unfamiliar with Arbela, you are frustrated by Curtius; you cannot visualize Cape Actium and therefore wonder at Caesar’s victory; unacquainted with the Catalaunian Plains, you cannot locate Aetius’s defeat of Attila. The General must know where he may lead his army, where encampment is best, where ambushes can be laid and where carefully avoided. Cyrus was routed and slaughtered by Tomyris, queen of Scythia, for no other reason than his unfamiliarity with the terrain. Crassus’ Parthian campaign was an abject failure and Caesar’s campaigns throughout the world supremely successful because Crassus was ill informed and Caesar supremely well informed about the terrain on which he led his troops. How, without knowledge of geography can we bring back over land and sea from far-off countries whatever is lacking in our own? This cannot be done without ascertaining the bearings of the compass and the positions of continents and islands. Geography has paved the way not only for happiness and comfort of humanity but for its glory. Were kingdoms not separated by rivers, mountains, straits, isthmuses and oceans, empires would have no confines nor wars a conclusion. Wise is the prince who, curbing his ambition, is content to learn not from his greed but from his geographers the natural extent of his kingdom. Those who scrutinize the heavens cannot avoid exploration of the corresponding circles, zones and climates on earth. They cannot correctly explain either the division of night and day or the vertical and oblique rising and setting of the stars unless by relating the heavens to the various regions of the earth through their observations. All this severally and in combination demonstrates that geographical maps are simply indispensable. It would be churlish of me not to acknowledge that Joan Blaeu has set down the basic information that I had evaluated to establish the origination of a Portolan Charts slew. I must also acknowledge the several books and master book of the Atlas Maior by Taschen. Thus, the simplest statement that I can make here is, because of a lack of knowledge Portolan Charts and Atlases from the 13th to the 16th centuries were merely copies of a template which I believe would have been a Roman map or maps. There was little or no opportunity for anybody to survey the whole Mediterranean Sea from 500AD to 1200AD, even though this period saw the growth of the Maritime City States, and the journeys by sea for the Crusaders. But these Portolan Charts are all skewed anti-clockwise by varying degrees according to the competence of the draughtsperson involved and as has been clearly shown this skewing was not the product of a “magnetic compass” being employed in the construction of the chart, but measurement errors. Those errors continued for over 400 years. My texts ChPV/1; ChATL/1 and ChDgH/1 clearly indicate this fact. Thus I now explain my research which indicates that the 12 degrees was a Roman original and in all probability was part of a genre of mapping from all aspects of Roman life. There are two distinct traits in Roman studies, the practical and the ethereal. Practical studies are easy to evaluate and extend over a variety of subjects such as; Architecture, Surveying, Map-making, Water supply and pumps, Road building, Bridges and exploration. There are a myriad of ancient texts which set down this knowledge, but one text, “Natural History” by Gaius Plinius Secundus, (23-79CE) encapsulates some of those subjects. However running parallel to the practical subjects were texts on mathematics, astronomy, astrology and the “arcana” of the magical tradition derived from the Etruscan traditions of Haruspy. Thus we must not segregate these two strands as they were so very well interwoven into the daily life of most Roman Citizens, particularly those who wrote such texts and no doubt because of their official offices they actually practised the arcana. We must also consider the development of the Roman Empire from its foundation to understand the geographical knowledge gained and when. Obviously Rome gathered in the Greek knowledge and used it to enhance their own knowledge with works by Herodotus, Eratosthenes, Strabo and many more concerning geography as well as the esoteric works by such as Pythagoras, Aristotle, Plato, Sophocles and Xenophon. Greek culture probably dates back to 2000BCE with the Minoans and then in 330BCE we have Alexander the Great and his adventures. Then around 275BCE, Rome having conquered the whole of Italy expands to take Greece, Carthage, Hispania and Gallia by 46BCE. But it is not until from 27BCE to 68CE that Britannia, N Africa & Aegyptus come under Roman control. 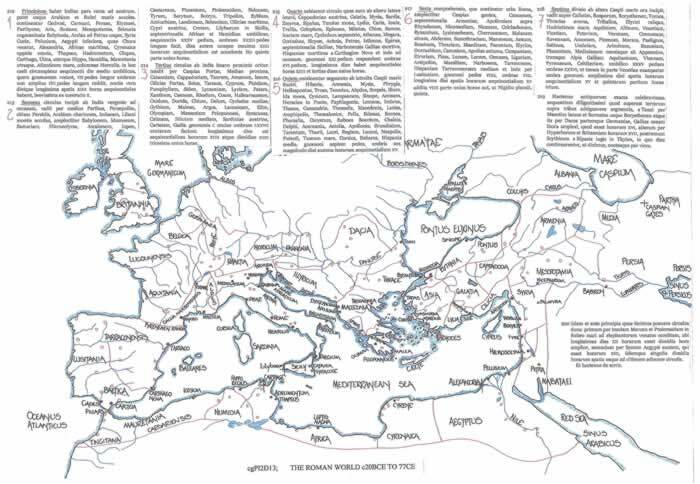 Thus we can understand that a complete Roman Map of its “Empire Lands”, the maximum extent being under Trajan (98-117CE), could not have been but a piecemeal expansion of the survey required by Julius Caesar c54BCE and Agrippa’s map of c11BCE. Therefore I opine that various maps were drawn by and for the Roman State adding territories as they were conquered and thus surveyed and consider that the map by Agrippa, described by Pliny the Elder, is probably a forerunner of, and thus the origination of Portolan Charts. The following abstract is taken from my 2011 paper, cgPl/2, and is merely copied as per that text was originally written without comments, which follow later. I am concentrating on two chapters from “Natural History”, 38 and 39 of Book 6, as they contain the distance measures applicable to the Mediterranean Sea, the Zones of the Climates and the Astronomical/ Astrological data which illustrates the origination of the 12 degree slew now found on Portolan Charts. 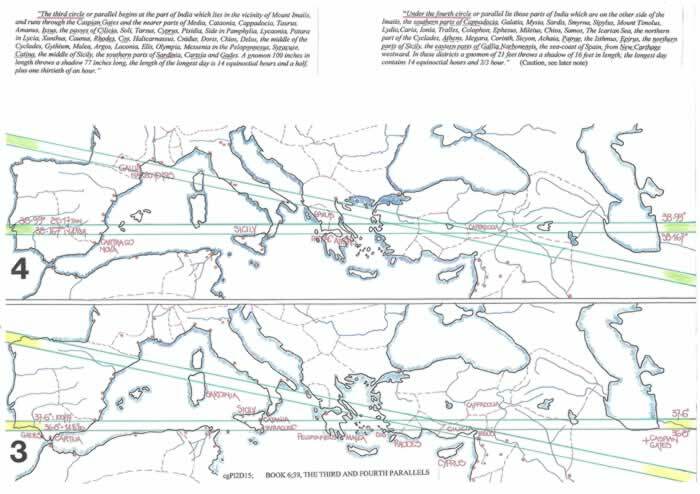 The text within Pliny’s “Natural History”, Book 6, Chapter 39, entitled ”Divisions of the earth into Parallels and Shadows of equal length,” discusses the lines or segments which divide the world; Roman Circles and Greek Parallels. However, at first glance the Latitudes and Climates of equinoctial hours do not agree, nor are they regular in their subdivision, but a mis-match of alignments. It was the ancient Greeks who commenced investigating scientific matters in a logical and progressive manner. They had the preparatory works of the Mesopotamians, Babylonians, Chaldeans etc, but, enhanced the research into mathematics, geometry, geography, poetry, music and of course the written word. Their geographers speculated upon the form of the earth and indeed correctly identified the earth as a globe in a sun-centred universe. The fact that the earth was tilted in its plane of travel and there was a slight wobble in its tilt led to the ecliptic and precession being defined. Many of the astronomical and astrological phenomena first explained by the Babylonians etc were used to expand their knowledge and gradually filled the night sky with the Heroes and fantastic animals we now discuss when viewing the star clusters. Then the Romans arrived, very different peoples who, whilst appreciating Greek philosophy, learning and technical ability endeavoured to become their betters in many fields. But, thanks to the Roman acceptance of other cultures, religions and use of their technical knowledge, Greek methodology was maintained alongside the Roman and enhanced in the one field most interesting to us, Cartography. Perhaps the first Greek geographer to teach the doctrine of the Earth as a sphere was “THALES” c640BCE. He also clearly stated that the equator of the earth was cut by the line of the earth’s orbit against the background stars, the Ecliptic. However, astronomy had been developed in the Mesopotamian region and inscriptions from there found on clay tablets, plus texts from the Egyptian Temples and Pyramids of the same era are evidence of those astronomical cultures from before c3000BCE. Indeed at Denderah on the River Nile, within one of the roof chapels dedicated to Osiris and his resurrection, the ceiling had a unique Zodiac. Unfortunately it was removed by French collectors in 1800CE, is now in the Louvre, but has been replaced by a plaster cast. Thus the stars and their given names and property’s were very important to these civilisations including the Romans. These civilisations noted that as the Earth travelled through space circumnavigating the Sun certain star formations were repeatedly observed year by year. The Babylonians had already divided the circle into 360 divisions or degrees and their sexagesimal system allowed for the 12 major star formations to be determined upon the Earth’s circuit of the Sun. This led to the band of stars having not only a circular dimension, but, also a band width either side of the plane of the Earth’s travel, the ecliptic, when viewed from earth. Transfer the circle and band width by two further circles onto the face of the earth and correct for the tilt, then the Equator plus the Tropics of Cancer and Capricorn are formed. Then, as there are 12 signs of the zodiac and 12 months of the year, when a Star sign cut the Equator the dates for each action could be established and Astrology, “good luck” or similar prognostications were born. For our purposes the Star signs are less important than the Ecliptic and Tropics. Those angular lines set at c24 degrees to the Equator, when transferred to the globe and set at 24 degrees north and south of the Equator can provide us with a totally different form of what we now know as Latitude and Longitude. Thus from a given point on the earth’s surface a graticule can be drawn based upon the Babylonian 360 degrees or 6 x 60 degrees (as Eratosthenes chose) set at c24 degrees incline to the equatorial line. However, that is not the only possibility. The equatorial line and the two tropics also form secondary angular alignments by utilising all three lines. They are, from the Tropic of Cancer to the Equator and then from the Equator to the Tropic of Capricorn. The diagonal lines joining the pairs are secondary ecliptics and of course are parallel and at c12 degrees to the Equator. Thus astrologers and geographers had a choice of graticule to utilize when constructing a map of the oikoumene or the world. The Greek word Clima is literally a slope or inclination. Geographically it is supposed to be the slope of the Earth’s surface and is used by Romans such as Vitruvius in its Latin form of “inclination” (and also declination and divergentia). 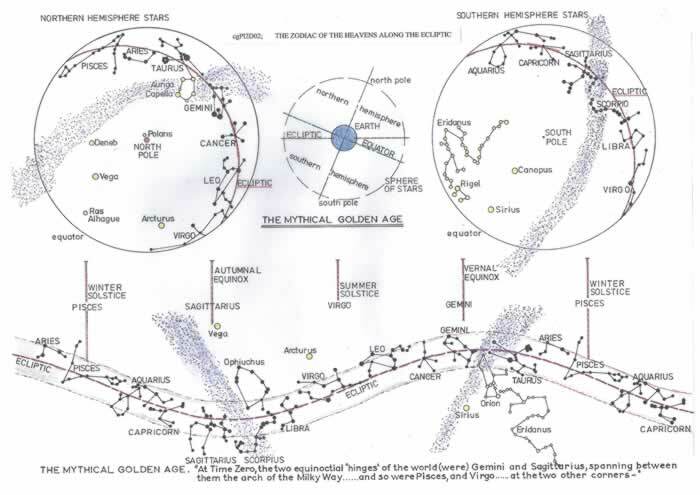 Thus it would appear Plutarch is discussing the zenith as the vault of the heavens with the pole star there-at. 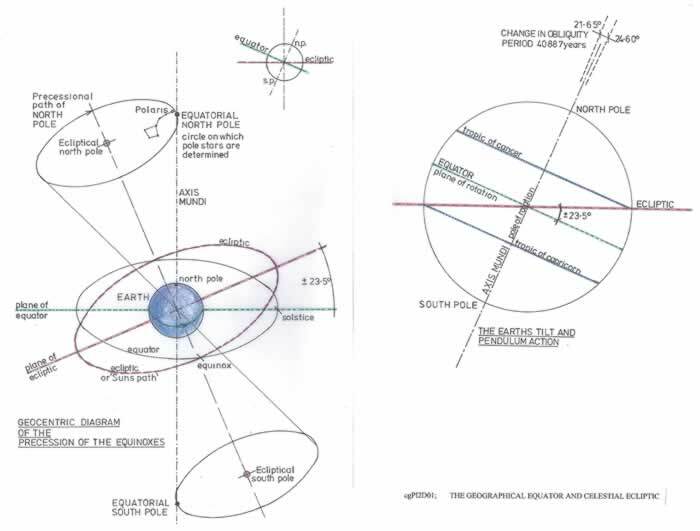 With declination of parallels and a great elevation for the Pole we can assume sloping or ecliptic parallels, or else the pole has no parallel as such. An inclination to the plane of the equator is precisely the ecliptic and its parallels found by the apparent progress of the earth across the star signs of the heavens. 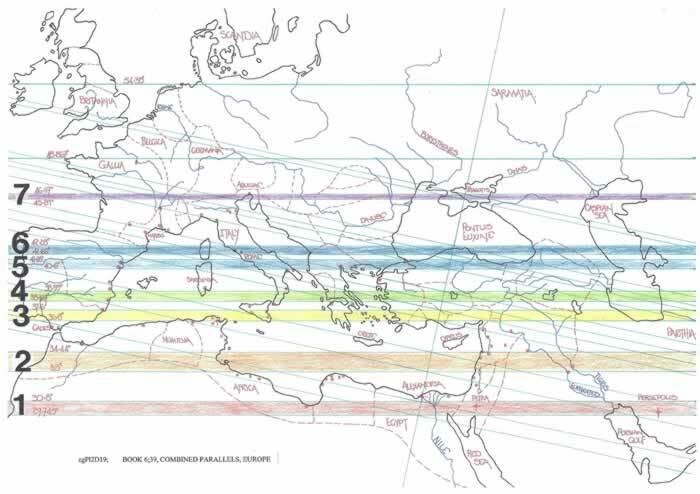 Thus it is possible to opine that the original Greek Clima were derived from Babylonian astronomy/astrology and paralleled the ecliptic or its semi-part and originally the graticules dividing the earth’s surface into zones/bands were inclined to the equator. But at all times the inference is Clima or Klimata set at an angle to the equator and not simply latitude as we would recognise. That is in all probability the part ecliptic. How else could the whole of the North African littoral fall under one Climata, even a slightly extended Climata, when Alexandria is 310N and the Pillars of Hercules are 360N? Thus the distorted maps of previous researchers were drawn trying to contort that littoral into compliance with the text description. But, the second circle or parallel covers the landscape from Persepolis at 29° 55’N, to the southern parts of Cyprus and maritime parts of Cilicia, the latitude of the whole Mediterranean Sea at 36/370N. In the previous text I adhered to my primary statement that I was merely illustrating the geographical data that Pliny had included in his text, and based upon a geographical map endeavoured to illustrate the complexity of the parallels described in Book VI chapter 39. The complete text of that book chapter is now repeated so that the actual reasoning behind the text can be illustrated and thus the maps format exposed. “The first begins at that part of India which looks towards the south, and extends to Arabia and those who dwell upon the borders of the Red Sea. It embraces Gedrosi, the Carmanii, the Perse, the Elymaei, Parthyene, Aria, Susiane, Mesopotamia, Seleucia surnamed Babylonia, Arabia as far as Petra, Coele Syria, Pelusium, the lower parts of Egypt called Chora of Alexandria, the maritime parts of Africa, all the cities of Cyrenaica, Thapsus, Adrumentum, Clupea, Carthage, Utica, the two Hippo’s, Numidia, the two Mauritanias, the Atlantic Sea, the Pillars of Hercules. Within the meridians this parallel, on the middle day of the equinox, the pin of the dial , usually called the gnomon , if 7 feet in length, throws a shadow at mid-day no more than 4 feet long, the longest day and night are 14 equinoctial hours respectively, the shortest being only 10”. “The second parallel runs through the country of the Hypoborei and the Island of Britannia, the longest day being 17 hours in length. Thus ends the geographical text of Pliny. Whilst analysing the above text for cgPl/1 it was very apparent that there were other possibilities to explain the parallels as described by Pliny. Thus by using a Mercator/Meridional Parts map projection of the world from India to Iberia/North Africa and of course Britannia it was possible to trace the alignments described in the text of 6/39. Diagrams cgPl/2/D14 to D18 illustrates the parallels first singularly, but using both determinants, that is shadow length and day length, to plot a pair of parallel lines across the maps surface. 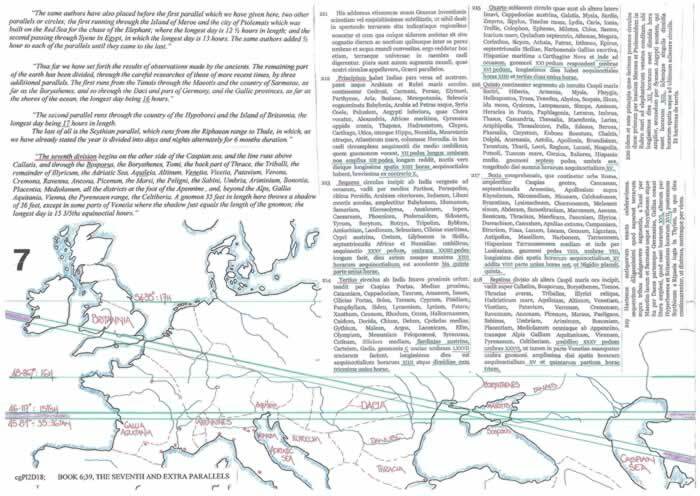 There is then a combined parallels map of the Mediterranean area and finally a combined parallels map from India to Europe, the full extent of the text descriptions. 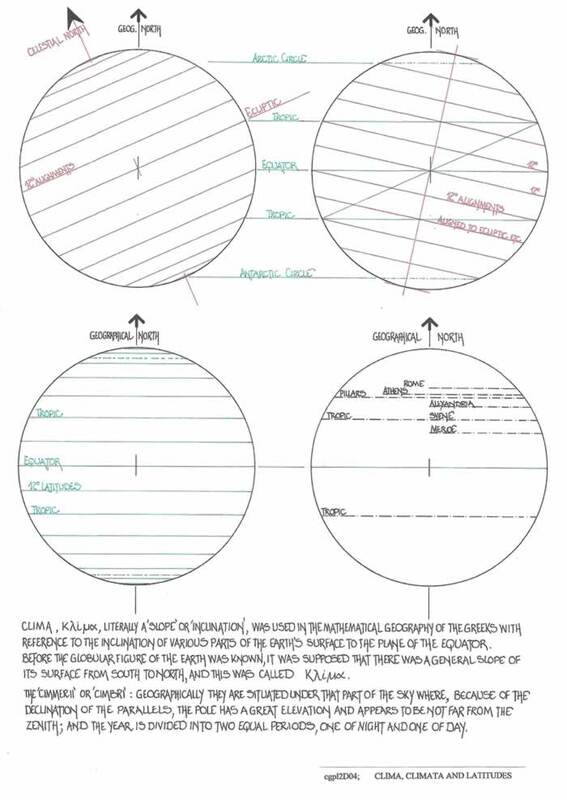 They have been colour coded as the original diagram in cgPl/1/D16 and I have appended Pliny’s text for each so that the alignments can be followed across the map. Northernmost land area, Pillars of Hercules, 36°N. Thus we have a 12 degree latitudinal shift between the places described, but only a single degree in terms of detailed positioning. 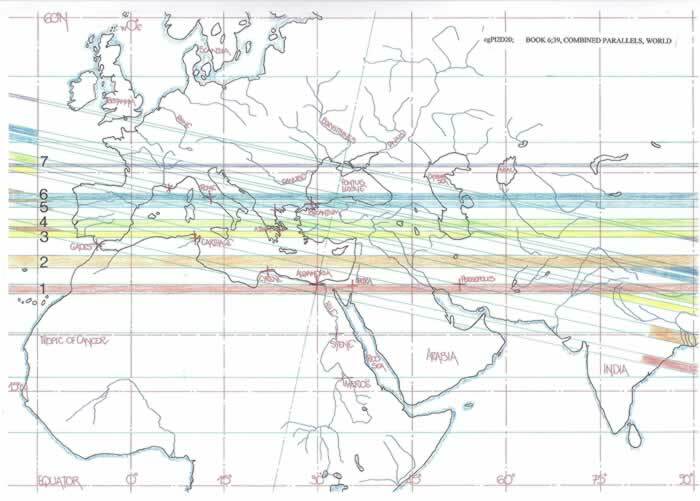 But, if having drawn the two latitudinal lines at 29.745 and 30.8 degrees north we then draw a line from the borders of India on the ocean to the Pillars of Hercules we find that it is basically a 12 degree angular line and thus the half ecliptic angle formed by a line from either Tropic to the Equator. There is a further coincidence with this line, it passes close to Alexandria. 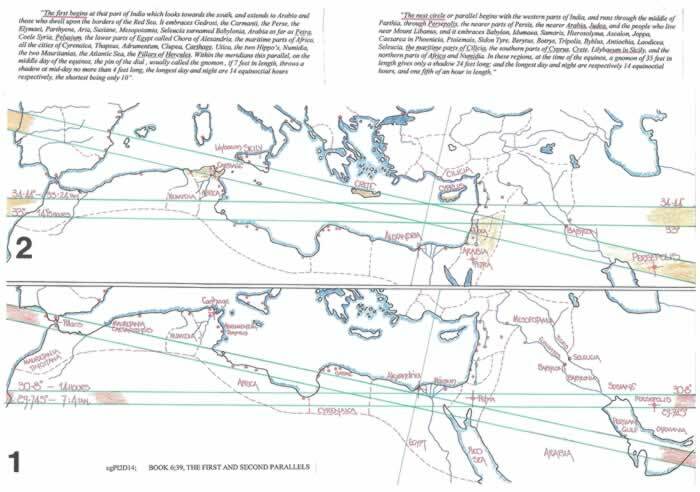 Thus if we actually draw a 12 degree angle line, basically towards the Poles through Alexandria and then from where it crosses the two latitudinal lines draw the 12 degree semi- ecliptic parallels we find that they encompass completely the land areas described by Pliny in his First Parallel text. That is they encompass Gedrosia/Carmania, the littoral of Egypt and Cyrenaica, then Africa, Numidia and finally the two Mauretania’s to the Pillars. Thus we see the astrological data being entwined into the geographical data and the reason for the mention of Nigidius Figulus within Pliny’s text at the 6th parallel. The above investigation indicated one curious feature which must be examined; the apparent alignment of The Sacred Promontory to Alexandria via the 12 degree astrological line. The appellation Sacred Promontory was originally a Greek naming of many such promontories, probably from their propensity for placing Temples at such points. But, the Iberian promontory only has some Neolithic Stones, sacred no doubt to those Peoples, but, for a long period this was the end of the oikoumene. Strabo and Artemidorus describe this place with its nearby Stones, but are they referring to Ponta de Sagres, which is where the Stones are and not actually Cape St Vincent which is only c5Km distant. Ponta de Sagres translates as Sacred Point, but that may be a later appellation. Although these two points are so very close together, thus for most purposes it matters not which is chosen, the curious alignment from Alexandria at c12 degrees may account for the reasoning by Marinus the Tyrian and Claudius Ptolemy to use this point as their prime measurement. Yes, this ignores the 2 ½ degrees from the Fortunate Isles, but in fact they are unimportant within their texts. The most important fact is that the Sacred Promontory is so very precisely located north of Alexandria by Marinus/Ptolemy as I illustrate in texts Cp2 and Cp4. This point is the second most prime locator for their geography after Alexandria. Thus we have a 6 degree latitudinal shift, but a spread of 33° to 34.439° given. 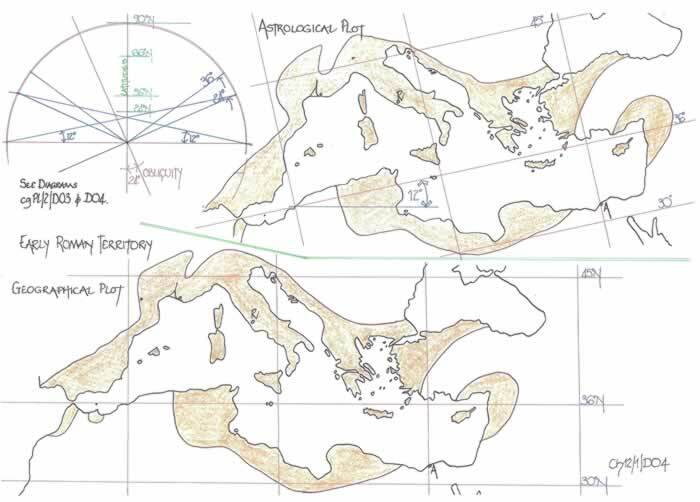 The normal latitudinal band given encompasses the central area of the eastern Mediterranean littoral and practically the same parts of Numidia and Mauretania as the 12 degree lines described within Parallel 1. The 12 degree alignment does however cover Persepolis, practically the southern parts of Cyprus, Crete, and Lilybaeum of Sicily. It does not include the maritime parts of Cilicia and thus it is possible to opine that this is a scribal error in copying. This should be part of the third parallel. Thus we have a 2 degree latitudinal spread and a 0.8 degree given span. This 3rd parallel is mainly described by the 0.8 degree span given by Pliny from the Caspian Gates to Gades along the 36th and 37th parallels. The inclusion of Cappadocia could be seen as a scribal copyist error as the 4th parallel section includes the “southern parts of Cappadocia”. 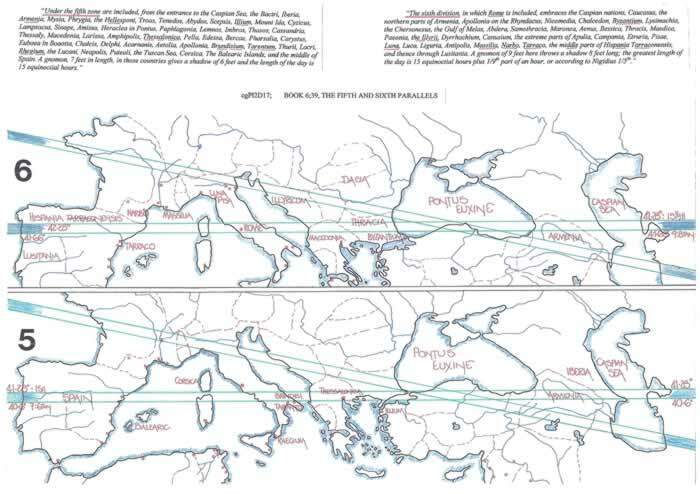 However, the 12 degree band alignment does indicate another anomaly, that of Northern Sardinia being encompassed and not Southern Sardinia as Pliny’s text states. It is hard to explain this as other than another error, as shifting Sardinia northwards would create a rather large expansion of the Mediterranean Sea latitudinally, given its geographical position. The fourth parallel with its adjusted ratio fairly represents the geographical facts as the diagram illustrates. But, “the eastern Parts of Gallia Narbonensis” are only correct on the 12 degree plot. There is however an alternative view. scribal error as the latitudes were reversed, and this could be due to a mis-reading of 17, that is xvii written as xvi. A simple error which if corrected placed the 4th parallel at 38° 59’N, i.e. above the third parallel and approximately midway between the 3rd and 5th parallels. 4th Parallel; 37° 36’ Gnomon and 380 10’ longest day. The longest day hours are maintained as written because they form a natural progression. 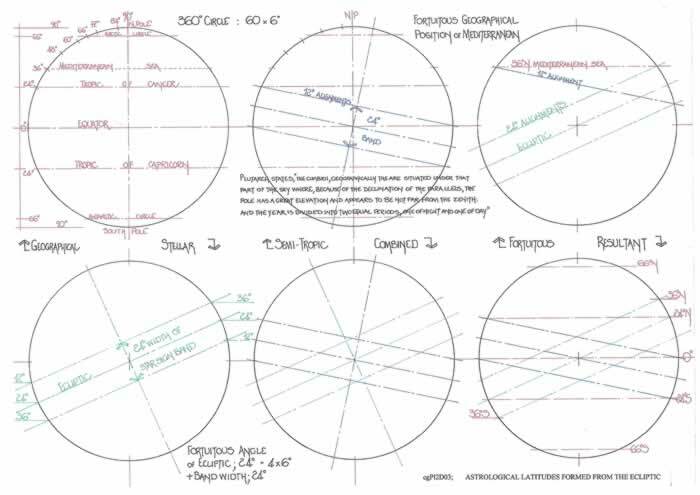 A separate diagram for the reversed 3rd and 4th parallels has been included to indicate not only the probable correctness of the assumption by the numerous correspondences of Poleis, but also to indicate that the 12 degree alignment is also maintained commensurate with the latitude. The revised 4th parallel now at 37° 36’ provides for a correspondence with most Poleis situate c38N, but surprisingly Ephesus is situate at 37° 36’N as well as Carthago Nova, and these are no doubt the positions where gnomon readings would have occurred. It is obvious from the text that there is substantive scribal error within all of the parallels, but particularly the 3rd and 4th, with Chios in both and the Southern parts of Cappadocia (4th) following Cappadocia (3rd). However, this is probably as close as we can get to the original text. Thus we have a geographical spread of 6 degrees and a given spread of 0.6 degree. But this fifth parallel indicates that there is a copyist error with the addition of Euboea in Boeotia and Delphi, which should be under the 4th parallel along with the Balearic Islands. This sixth parallel appears to be an amalgam of both the latitudinal lines and the 12 degree alignment to incorporate all that is contained between them. Pliny knows that from Rome to Pisa is a long journey north but in describing them as belonging to a single parallel he must be merely reading from a map with a band width which we are not privy to, other than angular lines. This seventh parallel reverts to a normal picture having places within the latitudinal alignments. The 12 degree angular alignment appears to play no part in the text, which is probably because it projects into lands above the River Danube, an area unexplored by Ancient Greeks. On this diagram I have included two further parallels (of 3), the first of which Pliny indicates as having 16 hours day length or at 48.867 degrees north passing through Dacia, Germany and the Gallic Provinces. However it is worth noting it is far to northerly for the Maeotis which should be named in the actual 7th parallel. The second additional line or parallel Pliny clearly states is running through the country of the Hyperborei and the Island of Britannia, the longest day being 17 hours or 54.383 degrees north. This of course only occurs at the North Pole, 90 degrees Latitude (or there-about), and we naturally assume that this Scythian parallel actually extends from the Arctic Circle, day length c24 hours, through the various stages of month long days to the 6 months day length at the North Pole. This conflation of c24 degrees for the northern areas is perhaps a guide to the foregoing text in that it is a generalisation of places around the various parallels and not an exact reading of geographical locations. Pliny then describes another two parallels placed before the first, through Meroe and Syene. Here there is clearly a conflict of data as the day length given as 12 ½ and 13 hours for Meroe and Syene, are in fact for the Torrid Zone and Meroe. We should be reading 13 and 13 ½ hours for Meroe and Syene, thus his final comment that; ”The same authors added ½ hour to each of the parallels until they came to the last” is pertinent. We may therefore assume there were parallels south of Alexandria, not counting the Equator at 12 hours, those of 12 ½, 13, 13 ½ and thus Alexandria being on the 14 hour climate. The complexities of Pliny’s examples in 6:39 are well illustrated when the parallels are drawn upon a single map. It would be nigh impossible to read from just one map incorporating both the standard latitudinal bands and the astrological 12 degree inclined bands. Therefore we may assume Pliny is discussing two near geographical maps with these alignments indicated. In my texts ChATL/1 and ChDgH/1, I illustrated how the double measurement for a degree, 75 & 90, were taken from the same scale bar as degrees of latitude and this caused a gradual slewing from the putative 9W longitude to the 1W longitude which is the eastern limit of the Iberian north coastline. At this point the slewing has increased from zero to 12.040 (calculated), but this angle varied slightly according to the accuracy of the draughtsman, but whatever it was, it continued across the western Mediterranean Sea to the 9E longitude from Genoa/Corsica/Sardinia to N Africa. Then the residue of the chart just followed this slewed angle and was increasingly awry through the Aegean Sea and then the Black Sea. But it must always be remembered that the west coast of Iberia was always drawn due north/south and this accorded with the wind rose setting out. 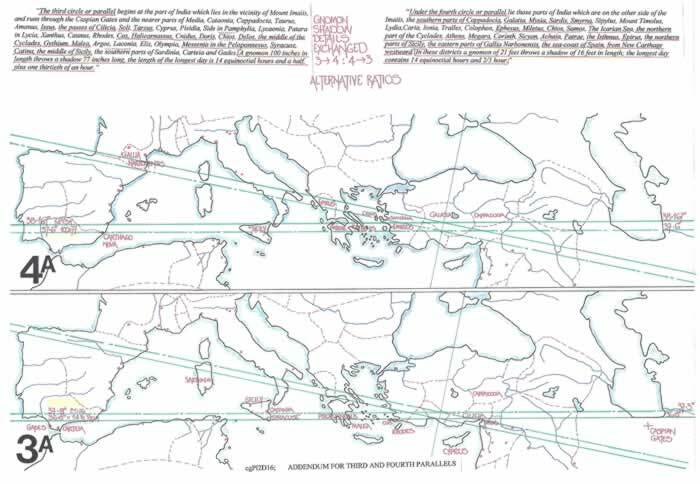 Thus in 2011 I opined that there were two near geographical Roman Maps, one having the Equator as its basic latitudinal alignment and the other using the half Ecliptic line from the Equator to the Obliquity line, a 12 degree inclination, and thus an astronomical alignment. This alignment is also the “Clima” as I have discussed, being capable of the description, “declination of the parallels”. Therefore it is but a small step to determine that these two maps were not only contiguous, but probably formed the normal usage by the Roman Elite who would have understood their dual function. But with two differing maps, differing only in the fact that one was slewed 12° anti-clockwise, and that is not necessarily observed unless the geographical map is alongside it, I would be surprised if they were not labelled as appertaining to the “Heavens” and the “Earth”, I believe we are left with one obvious conclusion that the “Astronomical/Astrological” map survived. But as it appears both survived then the obvious answer to the change in the Iberian Peninsula format is assured. Firstly the “geographical” map is expanded decade by decade to encompass the ever expanding Roman Empire and it was obviously drawn to the standard Roman Measurement of a Roman Mile, of which 75 make a degree of latitude. Then came the unfathomable change in the measurement system, that of confusing 500/600 stadia per degree and increasing the numbers from 75 to 90 whilst keeping the actual degree measurement the same. This is totally without logic and exemplifies the total lack of mathematical and metrological knowledge which followed the death of the Roman Empire. Individuals were studying ancient texts, reading about a latitudinal degree having 500/600 and even 700 stadia and merely accepting they were the same stade per degree. Of course they are not and thus we have the complete nonsense portrayed on Portolan Charts, and in some texts. Simply put, an “Astronomical” map of the Mediterranean Sea which was devoid of the Atlantic Coast of Europe and the British Isles was altered by a “Geographical” map showing those areas, which had a scale bar noted in Miliaria, when the scale bar was Roman Miles on the “Astronomical” map and the missing coastline etc was drawn from the Miliaria scale bar and hence Iberia, west and north was drawn 20% smaller than it should have been. The west coast of Iberia was drawn due north/south to accord with the template map and the 12° slew fitted quite perfectly to the distorted Iberian format now drawn. This was so simple a mistake, but so devastating for the charts of the Mediterranean Sea, when they were required for the expanding sea trade and, this distortion would see 19th and 20th century researchers grasping at straws to account for the 120 anti-clockwise slews. From c70AD the answer to the slewing of Portolan Charts has been in the textual records. The fact that historians and researchers with no real knowledge of a charts inner working, its construction, have chosen to ignore written facts and grasp at straws apropos the “magnetic declination” storyline is perhaps quite damning. 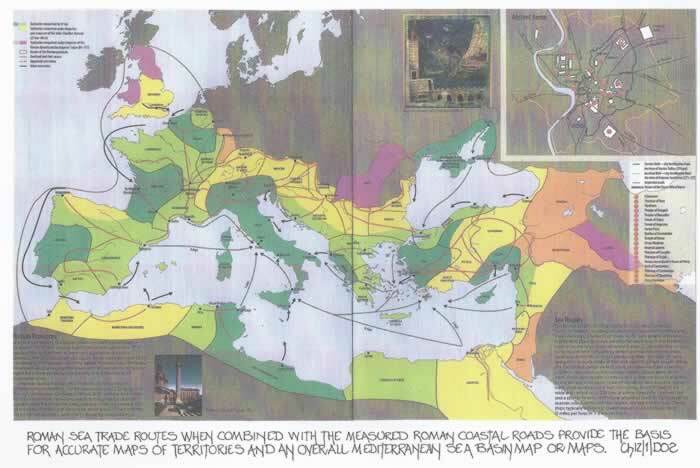 The records show that Rome surveyed the whole of the Mediterranean Sea. They also show via “Lo Conpasso de Navegare” that within its Peleio section the wind directions are generally correct to the geographical points of N/S/E/W and that is conclusively proven in my text ChLCN/1. However, there are conflicts as already shown within that text which indicate a second source. Thus it is quite obvious that the text used at least one rather well drawn and measurement accurate chart to produce the bearings which could have been read off the chart and, most of the Peleio’s are from Roman points in the Mediterranean Sea. 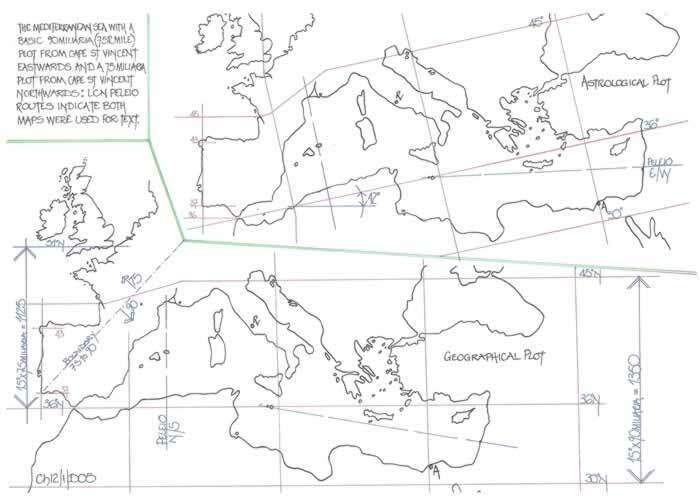 Thus the main section of the Mediterranean Sea from the Levant to the Pillars of Hercules has been correctly drawn by Roman Geometers to a geographical graticule based upon a degree of latitude being 75 Roman Miles, and in all probability a degree of longitude being 60 Roman Miles to agree with the known fact of a 4/5 ratio between the two at 36N. The fact that “Lo Conpasso De Navegare” chooses to state that from Gozo to Gozo Creti to the Levante is due east is not a factor that should be considered contrary to the above as the two charts were obviously concurrent. The text was written over a long period and probably not by the same person, thus two maps would undoubtedly be quite probably and separately used, thus this same area has been drawn commensurate with the ideas of Astronomy/Astrology and set at an angle of 12 degrees to the Equator, mimicking the half Ecliptic line. That fact will, as shown, account for the Gozo/Gozo Creti alignment. Unfortunately this is the map which survived to become the template for Portolan Charts, the sole survivor (query) that could be used by “cosmographers” of the 12th to 16th centuries. But the “geographical map” survived for the” Lo Conpasso de Navegare” text to be written, and suggests that it is merely a translation of an original Latin Text. No date is known for its origination only perhaps that its final version was in 1296AD. I therefore opine that the basic Portolan Chart is nothing more than an original Roman Map or Maps copied probably in the north of Italy at one of the large Monasteries where the two facets, text and map were together and were then “sold” to other Monasteries and ended up being copied by very excellent draughtsmen and miniaturists’, who unfortunately were not mathematically competent to spot, or know about the inbuilt problems presented to them. Hence, I return to my 2011 observation that, “we may assume Pliny is discussing two near geographical maps with these alignments indicated”. Astronomy/Astrology may have “pipped” geography in the race for survival. The following is an abstract of the text written by Joan Blaeu, 01/01/1665. The ancients further distinguished the Equator southward and northward into Climates and Parallels according to the varying duration of the longest day of the year. For those who live at the Equator have days equal to their nights throughout the year, both lasting twelve hours. But the further a region is removed from the Equator toward one of the two Poles, the greater the amount by which its longest days exceed those of regions nearer the Equator. The same holds true of nights. According to the increase in the longest day, the Ancients divided the earth northward and southward into Climates and Parallels. They called Climate the extent of land contained between the circles parallel to the Equator such that the difference of daylight from one to the other was a half an hour. They named Parallels those between which the duration of the longest day increases by a quarter of an hour, so that each Climate comprises two Parallels. They count seven climates on either side of the Equator and name them after some celebrated town, island, river or mountain through which one Parallel in the middle of the Climate passes. The first northern Climate passes through Meroe, an island in the Nile; the second through Syene (Aswan), a town in Egypt; the third through Alexandria, capital of Egypt; the fourth through Rhodes, a Mediterranean Island; the fifth through Rome; the sixth through the Borysthenes, a Sarmatian river; the seventh through the Rhipaean mountains of Sarmatia. They give the same names to the Climates on the other side of the Equator, extending as far south as these others do to the north, merely adding the prefix Anti-, that is , opposite, thus defining the southern Climates as being the equivalent of Syene, the equivalent of Alexandria and so on. Some geographers have further added two climates to those seven, and others again five; new ones have increased their number to 23 as can be seen in the table (QV). Other geographers consider this form of division inappropriate, firstly because of the degree of inequality; the first climate being 127 leagues in width, the second around 34 and the twenty-third and last being merely one league wide; and secondly because they serve no purpose, it being as easy to establish the length of the longest day as it is the number of climates. Like any other circle, the circuit of the heavens and the Erath is divided into 360 degrees and each degree into 60 minutes. Now each minute on the Earth is equivalent to 1000 Roman Paces or one Italian Mile. And four of those miles make one common league in Germany. Hus one degree makes 15 German Leagues, which, multiplied by the degrees of a great circle gives 5400 Leagues as the circuit of the entire globe. In this way we discover that the diameter or thickness of the Earth is 1718 2/11 leagues and that the semi-diameter or distance from the surface to the centre of the Earth is 859 1/11 leagues. The Romans used formerly to measure the distance between places by thousands of paces, (Latin Millia) whence came the name Miles —— Four of these miles make one German League so that one degree of a great circle of the Earth contains 60000 Roman Pace and 15 German Leagues. (Unfortunately there is a large mix-up with miles and leagues and JB even states” the latter of which are 15 to a degree of longitude). The distance measures for a degree are still somewhat awry, and not described properly in the above schedule. If one degree of latitude is equal to both 60 English Miles and 60 Italian Miles, when in fact a degree is closer to 69 Statute Miles and thus the Italian Mile is by the same measurement actually 1.25 Roman Miles. (But note it is Leagues not Miles in the table above for the German, Spanish and French units.) Thus it is not an Italian Mile but a Millia Geometricus Marine, which is derived from the Roman Mile of 600 stadia by dividing by 10. Thus there are 60 units per degree of 10 stadia and of course therefore a single minute is a 10 stadia distance. This is of course a magnificent geographer’s measurement! Caveat Emptor; Joan Blaeu uses the Pico de Teida on Tenerife as his zero longitude. It is actually situated at 28° 16’ 20”N and 16° 38’ 33”W. Cape St Vincent is actually at 37° 01’ 30”N and 8° 59’ 40”W, which I normally quote as 37N/9W. Thus the distance between the two is 7° 38’ 53” which at 36N is 7.648 x 60RM = 458.88RM or 367.1 of his “Italian Miles” as each is in fact 1.25RM. Joan Blaeu has Cape St Vincent situated at 37N and 8E from Pico de Teida which is thus 8.642 degrees and will give a true reading of 43.5 Italian miles per degree of longitude at 36N. However it scales 12 German Leagues which is the equivalent of 48 Italian Miles and that figure is 4/5ths of 60, and would thus be Roman Miles. Naturally the latitude is actually scaling 15 G L which is the equivalent of 75RM per degree. It is unfortunate that Joan Blaeu should inter-mix measurements and in his text quote them awry. If he had kept to one measure for a degree of latitude and applied the ratio for latitude to longitude as necessary, the beauty of his charts would have been matched by an accuracy not seen before in the correct use of Latitude/Longitude measurements. By including the text of Joan Blaeu I have endeavoured to illustrate that there was a complete lack of understanding by these excellent map-makers of the mathematics which are the back-bone of a map or chart. That situation as far as I can ascertain has been extant from the original charts by Petrus Vesconte. Thus if those map-makers were so out of touch with the reality of the measurements of the world, how could they or their near forebears have understood and surveyed the Mediterranean Sea basin in the years 500 to 1200AD, That is not a viable concept as there is no adequate data to indicate they were adept at surveying. Thus I consider the only period when there was the time, energy and expertise to carry out such a task was in the Greco-Roman Period, such that Julius Caesar employed Greek Surveyors to carry out his task, but it was a Roman, Marcus Vipsanius Agrippa who achieved the presentation of a “World” map. That was the commencement of mapping as we would understand it and thus the precursor of the Portolan Chart, which is nothing more than a dressed up Roman Map of the Mediterranean Sea basin. I am not a Roman enthusiast by any means, I just tell it as the data indicates!!! M J Ferrar November 2017.